“An excellent novel. A lovely and moving portrait of society’s outcasts…affirms the essential humanity of its poor and stubborn residents, for whom each day of survival is a victory” (The New York Times Book Review). Set on the high ground at the heart of Cape Ann, the village of Dogtown is peopled by widows, orphans, spinsters, scoundrels, whores, free Africans, and “witches.” Among the inhabitants of this hamlet are Black Ruth, who dresses as a man and works as a stonemason; Mrs. Stanley, an imperious madam whose grandson, Sammy, comes of age in her brothel; Oliver Younger, who survives a miserable childhood at the hands of his aunt; and Cornelius Finson, a freed slave. At the center of it all is Judy Rhines, a fiercely independent soul, deeply lonely, who nonetheless builds a life for herself against all imaginable odds. 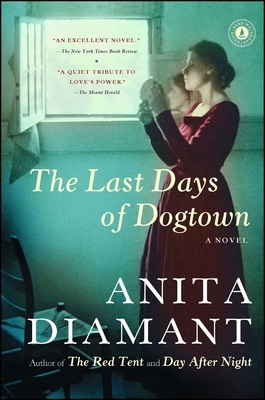 Rendered in stunning, haunting detail, with Anita Diamant’s keen ear for language and profound compassion for her characters, The Last Days of Dogtown is an extraordinary retelling of a long-forgotten chapter of early American life. Anita Diamant is the bestselling author of the novels The Boston Girl, The Red Tent, Good Harbor, The Last Days of Dogtown, and Day After Night, and the collection of essays, Pitching My Tent. An award-winning journalist whose work appeared in The Boston Globe Magazine and Parenting, she is the author of six nonfiction guides to contemporary Jewish life. She lives in Massachusetts. Visit her website at AnitaDiamant.com. "The book has a compelling, page-turning pull...with spare yet vividly descriptive prose." "[Diamant's] theme -- that life teems even as it dwindles -- has all the more power for its subtle, unsentimental articulation." "The book is haunting.... [It] will linger with you for days." "A quiet tribute to love's power."